A low pressure area is just off the coast and is moving eastward. 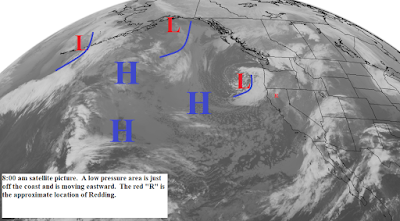 This system will move across Northern California today with showers and possible thunderstorms. Snow levels will be 2000 feet north and 2500 to 3000 feet south. Sunday there will be some lingering showers over the mountains which will end by late afternoon. Monday high pressure begins to build along and over the west coast and will hold there for the next 5 to 7 days (see map below). Skies will be mostly sunny with a few high clouds. Temperatures will be warming and by mid week will be 12 to 18 degrees above normal which means some north valley locations will break the 80 degree mark. Gusty north winds will occur in some areas Monday through Thursday.